I have a southern facing deck and live in Michigan. Which product offers the best coverage/longest lasting/UV Protection, etc. 100 or 1500 series? Was considering the Black Walnut or Dark Oak. Either series would last the same so choose the color you like. I used TWP #1530 Natural a couple of years ago, it has held up well. However I would now like to stain with #1503 Dark Oak. Which prep kit should I use for the best results. I have a recently stained pressure treated wood deck that was prepped and then stained with TWP 103 dark oak. There are a few shiny spots on the ends from too much stain and it has been 24 hours. Is there a way to fix this? I have a privacy fence that is about 5 months old. 225 feet long by 6 feet tall. How many gallons of would i need to coat both sides? About 25 Gallons for the 2 coats applied wet on wet for 2500 sq. feet. I am considering using your product to stain our 2-year-old cedar deck. It has not been previously stained, but has been thoroughly cleaned and prepped this spring. What is the difference between the 100 and 1500 series? Are both oil-based? Are the colors transparent or semi-transparent? We live in MN, and are looking for something that will weather as well as possible through our winters. Both are oil based with the main difference being the VOC compliancy for certain states. They are semi-transparent. Most use the 100 Series in MN. yellow cedar sided house. The wood for this house was seasoned by manufacturer. It then sat under roof on pallets for a year before being erected. It has now stood 8 months and we're ready to stain with recommended TWP and RAD. Here, however, it says Gemini for new, RAD for old, previously stained. Please clarify. For wood that is unstained, you need the Gemini Restore Kit for the prep. I am using TWP on a deck that was constructed 1 year ago and did not receive any treatment. It has some small amount of mold staining. If I use the Gemini Restore Kit do I need to use the Restore-A-Deck Stripper? No need for the Stripper. Just prep with the Gemini Restore Kit. I have a recently installed western cedar fence. Will one coat suffice? what kind of wood is used in the sample color pictures? 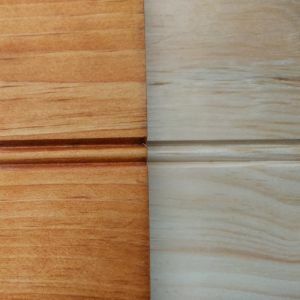 I'm staining some pine and put a single medium coat of TWP redwood on a sample (see attached, stained vs not stained). I know it's semi-transparent but I was surprised at how translucent it ended up compared with the sample color picture. I waited a few days for it to dry thoroughly and put on a second coat to try to darken the color but it wasn't absorbed at all. 24 hours later it was still wet and it all came off when I wiped it down. Is there a way to get the redwood or rustic in a semi-solid instead of a semi-transparent? Sorry but no. TWP only comes in semi-transparent colors. Staining a 4 month old cedar fence. Which stain and how many gallons. 1 or 2 coats Should I powerwash or garden hose spray down. We have a second story deck. Is it recommended to stain the bottom as well? No need unless you want for aesthetic reasons. With the side boards and deck, I have 1,273 square feet - how much twp do I need? For two coats applied wet on wet, about 11-13 gallons. The 100 series is available in my state. Is there any reason to use the 1500 rather than the 100 for a new constructed deck made with kiln dried pressure treated lumber?